Timothy Wiarda’s book is primarily how-to, discussing questions of the exegetical method that will help interpreters and expositors work with Gospel texts. He also discusses methodological questions relating specifically to the narrative material in the Gospels and focuses in on other fine details—the portrayal of individual characters, descriptive elements, the relation between theology and story, and more. Timothy Wiarda. Interpreting Gospel Narratives. Scenes, People, and Theology. Nashville: B & H Academic, 2010. viii + 245 pp. $24.99. 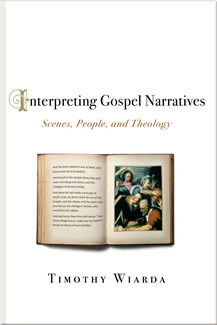 In his book Interpreting Gospel Narratives, Timothy Wiarda seeks to spotlight the narrative material in Matthew, Mark, Luke, and John, and challenge readers in their exegesis and exposition of this material. He does this by reexamining these stories for their character development, plot progression, and contextual organization. His goal is not to provide a new method of interpretation, but rather defend a “concrete reading” of the material and show the theological path the author was taking to present clear or nuanced theology. Chapter 2 | Story and Theology: What is the Point? Some of my reading this year has been among the works of Richard Sibbes. Sibbes (1577–1635) speaks with profound biblical truths that reach beyond his time and his theological background. A Puritan preaching within the Church of England, he taught with conviction on the current state of the world and the comfort found in our Christian theology. Martyn Lloyd-Jones said that Sibbes’ writings “quietened, soothed, comforted, encouraged, and healed me.” I felt that same comfort in reading The Bruised Reed. In this lengthy sermon, we enter into the pains of Christ on our behalf. We see his endurance, and it shapes our endurance. Sibbes expounds on many great topics along the way, but I found his words on the church then strong words for the church today. If we look to the present state of the church of Christ, it is like Daniel in the midst of lions, like a lily among thorns, like a ship not only tossed but almost covered with waves. It is so low that the enemies think they have buried Christ in the grave, with respect to his gospel, and there they think to keep him from rising. But just as Christ rose in his person, so he will roll away all stones and rise again in his church. How little support the church and the cause of Christ have at this day! How strong a conspiracy is against it! The spirit of antichrist is now lifted up and marches furiously. Things seem to hang on a small and invisible thread. But our comfort is that Christ lives and reigns, and stands on Mount Zion in defense of those who stand for him (Rev. 14:1); and when states and kingdoms dash one against another, Christ will have care of his own children and cause, seeing there is nothing else in the world that he esteems much. At this very time, the delivery of his church and the ruin of his enemies are in progress. We see nothing in motion till Christ has done his work, and then we shall see that the Lord reigns. Christ and his church, when they are at the lowest, are nearest to rising. His enemies, when at their highest, are actually nearest their downfall. The Jews have not yet come in under Christ’s banner; but God who has persuaded Japheth to come into the tents of Shem, will persuade Shem to come into the tents of Japheth (Gen. 9:27). The “fullness of the Gentiles” has not yet come in (Rom. 11:25), but Christ, who has the uttermost parts of the earth given to him for his possession (Psa. 2:8), will gather all the sheep his Father has given him into one fold, so that there may be one sheepfold and one shepherd (John 10:16). Progressive Covenantalism continues the research project of Peter J. Gentry and Stephen J.
Wellum, Kingdom through Covenant (Wheaton: Crossway, 2012). In that latter work, Gentry and Wellum propose a slightly different way of “putting together” God’s plan of redemption in contrast to the dominant biblical-theological systems of covenant and dispensational theology (and each of their varieties). Gentry and Wellum argue that the biblical covenants provide the backbone to the nar rative plot line of Scripture, and thus, it is essential to think through the interrelationship between the biblical covenants starting in creation and culminating in Christ, in order to rightly grasp the “whole counsel of God.” In fact, as one walks through the biblical covenants, one discovers how the plan of God is disclosed from seed to full bloom, and how through the progression of the biblical covenants, we discover God’s glorious plan of salvation come to its telos, terminus, and fulfillment in our Lord Jesus Christ and the new covenant he inaugurates. Progressive Covenantalism continues to develop the insights of Kingdom through Covenant by a team of scholars who accept the basic biblical-theological framework of the latter work, but now in this work developing that framework in areas which the initial book did not. Where Kingdom through Covenant could only hint at some issues and not develop them fully, Progressive Covenantalism picks up where the former book left off and provides further discussion and argumentation for the position. So, for example, New Testament scholar Thomas Schreiner writes on the Sabbath command from the Old Testament and thinks through its applications to new covenant believers. Christopher Cowan wrestles with the warning passages of Scripture, texts which are often viewed by covenant theologians as evidence for a “mixed” view of the church. Cowan disputes this reading of the warning texts and instead demonstrates how they can fit within a believer’s or regenerate view of the church. Jason DeRouchie provides a biblical theology of seed and demonstrates that the covenantal view is incorrect in some of its conclusions and Jason Meyer thinks through the role of law in both the old and new covenants. John Meade unpacks circumcision in the OT and how it is applied in the NT, providing further warrant to reject covenant theology’s link of circumcision with (infant) baptism. Oren Martin tackles the issue of Israel and land over against a dispensational reading and Richard Lucas offers an exegetical analysis of Romans 9-11 arguing that it does not require a dispensational understanding of this text. Other essays wrestle with the nature of typology and the role of the Mosaic law in the life of the Christian. All of the essays are seeking to advance the discussion within evangelical theology and to commend progressive covenantalism as a better way of thinking through God’s one plan of redemption as it is revealed and accomplished through the biblical covenants in Jesus Christ our Lord. This has been my favorite read this year. Mainly because I feel relieved to not be the only one that has struggled with aspects of Reformed Theology and Dispensational Theology. I grew up in the Southern Baptist tradition, and while I have been surrounded by, studied under, and worked with believers from the Reformed tradition, I cannot call myself Reformed in the popular way of placing everyone in a box. Maybe one day. For now though, I am following the points brought up in PC, because there arguments are deeply rooted in scripture that I long to understand. The biggest idea that I completely support is the need for supporting typology with regard to events, persons, places, and covenants within the Old Testament. Reformed Theology doesn’t always take into account how much Christ shifted importance of beliefs. Everything within the Old Testament finds its fulfillment in Christ. The temporary place holders of the OT were shadows, easily misunderstood. But now we have Christ and the Holy Spirit at work within us and the world. All this happened at the appointed time. The Tripartite (moral, civil, ceremonial) division of the law – This tradition goes back as far as Aquinas or maybe Tertullian, but who in scripture defines the law this way. Reformed Theology claims that at the very least God’s moral laws remain in effect. But in Matthew 5-7, Jesus gives rules that go above and beyond these moral laws. Paul is very clear that we no longer live under the Law of Moses but the Law of Christ. A New Covenant, not a Renewed Covenant – 2 Corinthians 3 and Hebrews 8 shows that things are different now, in fact, they’re better. Am I a Son of Abraham? – God has adopted me into his family, calls me a son, gives me an inheritance. Isn’t this also what Abraham saw and placed his faith in. They are counted as “seed” only because they are identified by faith with the “seed, who is Christ.” 30 The makeup of the new covenant community is shaped around the connection with Christ through a faith like Abraham’s (Gen 15: 6; Rom 4: 3– 5). Whether Jew or Gentile, covenant membership requires adoption into Christ by faith (Rom 8: 15; Gal 3: 26; 4: 4– 5; Eph 1: 5). This new covenant community stands distinct from that of the previous era because: (1) the members include elect from both ethnic Israel and many other nations of the world (Gen 17: 4– 5); (2) all of whom are heirs of the life-giving, barrenness-overcoming, miraculous power of God (17: 21; 18: 14; cf. Rom 4: 19); (3) who have witnessed a pattern of faithfulness (Gen 12: 2; 17: 1); and (4) through this have become recipients of divine blessing (12: 2– 3; 22: 18); and (5) who are now serving together under a king in the line of Abraham who bears global influence and rule (17: 6; 49: 8, 10). All of these are features of progressive covenantalism that highlight the centrality of Christ in God’s redemptive purposes (KL 502-512). While there have been a number of criticisms raised against the treatment of Reformed Theology in Kingdom through Covenant, I am thankful for this book for taking issues that I have seen and wrestling with them within scripture. After all, we can only go so far in defining how God operates. We are all grateful for the redemption that he has given us. I pray that men wiser than me continue to work out these issues with fear and trembling. We must also be cautious in how we portray our European/North American theology to believers around the world as the only truth. Even in the way we talk about their theological work as African Theology, Asian Theology, and South American Theology. May we always discuss these matters in humility. I have convictions that Progressive Covenantalism is a step in the right direction, but I welcome being shown more clearly the truths of God and his word.